On the last day of March 2016, the discipline of architecture awoke to news for which it was wholly unprepared: the loss of one of the polemical voices of our time. Zaha Hadid’s critical insight was not her only weapon: her unique manner of projection did to form, space and color what no other architect could do. More than anything, she spoke through her drawings, her work, and her dedication to architecture as a discipline. If the term “discipline” connotes the sound foundations of a clear and well-defined terrain, then she made sure to turn the certainty of those foundations upside down. While The Cooper Union never had the honor of having Zaha Hadid formally engage its School of Architecture, her work has been very much present in the culture and mission of our program. In 1983, then still a young graduate from the Architectural Association, Hadid marked her public debut with architectural markings that hovered ominously over the peaks of Hong Kong; her winning entry for The Peak was never built. Long before the era of digitization, she described spaces that were deemed impossible, implausible, and out of this world. And yet, as a master of description, Hadid understood something about the nature of the architect’s craft that makes our discipline so unique: architects do not build, they build drawings. With a career marked by great challenges — and a great many rejections, from Hong Kong to Cardiff — Hadid continued to draw, knowing that buildings are built twice, the first time on paper. She also gave new meaning to failure, with the idea that architectural research, by definition, must have the luxury of iteration, if only to reveal alternatives to a possible discovery. It is through these very drawings that Hadid provoked public conversations, not only in the halls of the academy, but equally importantly in the spaces of governance where her buildings were oft debated. Through these obstacles, her work exemplified an architecture that was less a reflection of society, but rather a projection of what it could be. She was emboldened by the responsibility to propel culture forward, if only to imagine that the agency of architecture mattered — and so it did, in her hands. In an era of relative conservatism, Hadid opened up the imagination for an entire new generation of work and research, making architecture yet again speculative, experimental, and a risk by which to look forward. 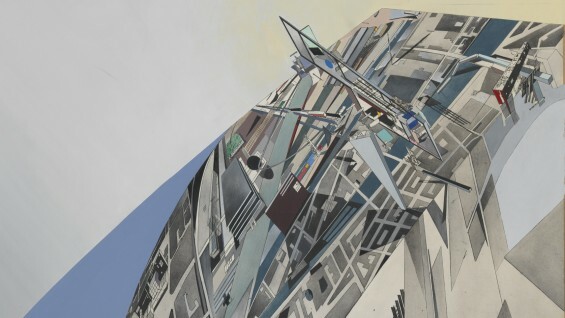 The drawings of Zaha Hadid were recently on view at The Cooper Union for the Drawing Ambience exhibition, as part of the exceptional Alvin Boyarsky collection. Those drawings reflect a commitment that, today, still forms a critical part of our ethos at Cooper: that drawings are a form of research in their own right. For Hadid, beyond the imperative to fabricate buildings, drawing was a form of building itself — to build ideas, arguments, debates. If her foundational research as an architect was not marked by a dedicated commitment to materiality, details, and the tectonic make up of buildings, then she demonstrated that the ideas she unleashed would become the definitive measures of different means and methods to engage the building industry. At her best, her buildings did not conform to the building industry, but rather transformed it, imagining new ways in which points, lines, and planes would be recast in material technologies that anticipated the future of fabrication thinking altogether. And so, with the complexities of the figural gestures that her drawings provoked, in parallel, her practice also developed an entire lexicon of material strategies dedicated to the assemblage and arrangement of parts. Her drawings built a path to the future we are now experiencing. To remember Zaha Hadid’s legacy as the greatest female architect of her time, which is duly noted in all the press, will be a great disservice to her memory. Indeed, Hadid was a great woman; she had voice, character, style, and presence. But far beyond her gender, she served as an exemplary architect, whose work — and discipline — would lead men, practice, and the academy to uncharted territories, where no one else dared to go. In a profession that is still characterized by a majority of men, she opened doors to speculation, risk, and form — something from which the entire discipline can only benefit. A life lost much too early; one can only imagine the decades of research she still had left in her. She left behind many things, maybe too many to enumerate. But for us, one simple ethic: the will to draw and project forth.